After an injury plagued 2016 season, Cleveland Indians outfielder Michael Brantley has done well to bounce back in 2017. Unfortunately, the injury bug has bit Brantley yet again. 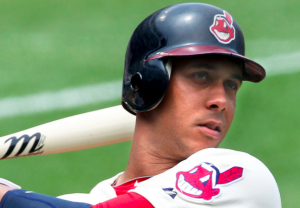 The Indians placed Brantley on the 10-day DL Wednesday with a sprained ankle. It’s the second time this year a right ankle sprain has forced Brantley to the DL. Brantley suffered the injury Tuesday night while running to play a ball hit to left-center field. The ball was caught by center fielder Bradley Zimmer, as Brantley pulled up lame and had to be removed from the game. An MRI later revealed a sprained right ankle. The Indians were initially hoping to give Brantley’s injury a few days before deciding whether to place him on the DL or not. But with Brantley suffering a similar injury this year and the Indians beginning an 11-game road trip on Thursday, the club decided to put him on the DL right away. However, both Brantley and the Indians are relieved that the injury didn’t turn out to be more serious. Brantley was specifically worried that it could be a torn Achilles tendon. On the season, Brantley is hitting .299 with an OPS of .802. His power numbers are not quite what they were in 2014 and 2015 when he was one of the best outfielders in baseball. But considering how little he played last season, he has bounced back better than expected. Brantley got off to a fast start in April, has avoided prolonged slumps, and was selected to the American League All-Star Team. The loss of Brantley leaves the Indians short-handed in the outfield. Zimmer will continue to hold down center field, with Brandon Guyer, Austin Jackson, and Abraham Almonte left to cover the two corner spots. Jackson has had a strong season in a part-time role this season. But neither Guyer nor Almonte has been particularly productive this season. Meanwhile, the Indians are also waiting to get Lonnie Chisenhall back from a calf injury. Chisenhall hasn’t played in nearly a month and is yet to begin minor league rehab games on his way back. An outfield of Brantley, Zimmer, and Chisenhall could be quite potent for the Indians. But there’s no telling when Cleveland may be able to put all three in the same lineup. Interestingly, the Indians chose to call up utility infielder Erik Gonzalez to take Brantley’s spot on the roster. Tyler Naquin was also an option to replace Brantley. He has spent most of the season in triple-A after a strong rookie season last year. However, Naquin is hitting .323 with an OPS of .907 in the minors this year, making it a surprise he wasn’t called up with two starting outfielders on the DL. In any event, with Brantley joining Chisenhall on the DL, there are some questions about Cleveland’s outfield for the time being. The hope is that both will be able to return by the end of the month, giving the Indians a powerful outfield on both sides of the ball. Until then, Cleveland will have to get by with a makeshift outfield, as the Indians try to hold off the Royals atop the AL Central.